Completed two more composite images. The first image I created, “I Forgot…” is going to be a hard act to follow, because it was dramatically lit and made for a dramatic final image. 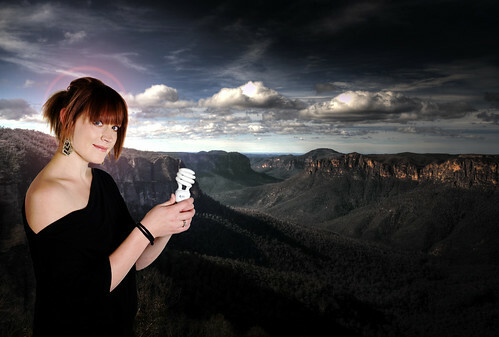 My original idea was that these other images would be attractively presented people holding *unlit* light bulbs as a visual representation of their participation in Earth Hour. Unfortunately, “attractive” is not so very far from “common” – we’re bombarded with images of attractive people all the time, and often they’re lit with diffuse “beauty” lighting, just the same as the way I’ve shot my models. So it’ll be a challenge to see if I can make any of the remaining images as interesting as my first one. The model has been positioned with her head in front of the brightest part of the sky, and I’ve added a lens flare behind her head so that it appears that there’s a bright light source behind her, forming a “halo” around her and achieving the goal I set out in my project proposal, to make my subjects look like sources of light. I’ve also hand-shaded the model’s clothing so that it looks almost like she’s standing in a pool of light coming through the trees, with the upper part of her body and her head in the light. In a dim, cool forest, a lens flare would be out of place, so positioning her head in front of the brightest part of the background image creates a very subtle suggestion of a “halo” around her. ~ by Q on June 5, 2009.